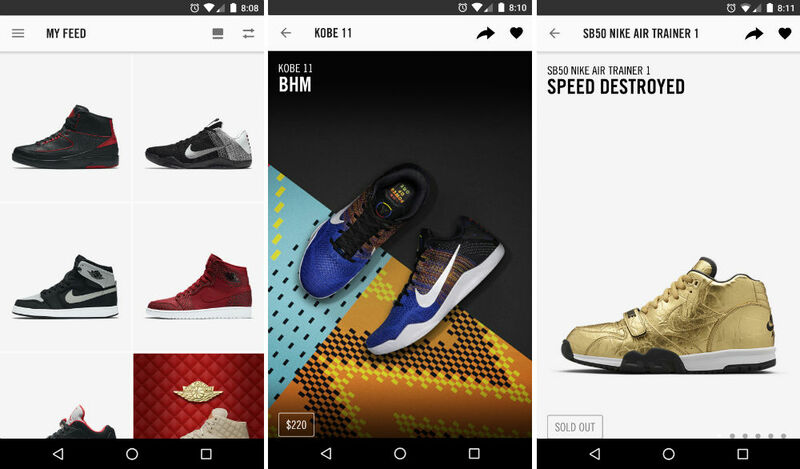 Nike, true believers that iOS is the one sole operating system for the general populace, finally released its SNKRS app onto Google Play this week after being available for Apple users back in May, 2015. For those who lineup or wake up early every Saturday and hop onto the computer to score the latest pair of fresh kicks, the SNKRS app can now handle all of your mobile shopping needs. The app is quite simplistic and easy to use. Upon booting up, you log into your Nike+ account, which should already have your billing and shipping info, then you browse Nike’s vast line of products. Users can search upcoming releases, as well as past releases. If you find a shoe you like, click on it, select a size, and purchase. At first launch, Nike requests that you input your favorite kind of kicks, which can help speed up the discovery process. For example, if you are a fan of Kobe, KD, Jordan, and Prestos, SNKRS will show you what’s available in those categories first. It’s a nice touch. If you fancy yourself a sneakerhead, there is no way you don’t download this app immediately.